I think I’m finally over my first case of stitchers’ block. I’ve been stitching continuously for about fifteen years And I’ve never before experienced this complete lack of enthusiasm to pick up the needle. Needless to say, my progress has slowed right down over the past few months but I’m starting to feel keen to stitch again now and hope to be releasing my next patterns soon. 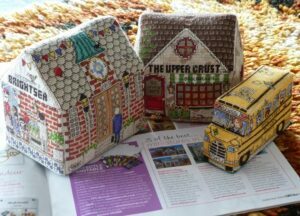 In the September Issue of Cross Stitch Collection (published in the UK) my BrightSea Village designs were shown in their “Three Of The Best” section. Big thrills for me. I did a little happy dance when they emailed to ask my permission. This entry was posted in BrightSea Village on October 23, 2014 by Elli Jenks.